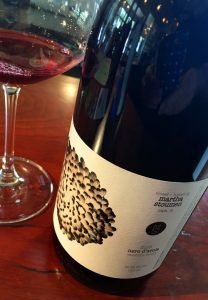 2016 Martha Stoumen, Nero d’Avola, Mendocino County. Martha Stoumen is a new vigneron that you should check out, she’s already got an amazing CV and is one of California’s stars in the natural wine movement, though I find her wines well crafted and pragmatic without the usually natty clumsiness, there less dogma and more passion crafted. Stoumen is to California what Bow & Arrow is to Oregon. This ruby/garnet hued Nero d’Avola, inspired by her time at COS, where she worked with Giusto Occhipinti, famous for his natural wines, some of which are aged in amphora like the ancients made them and where his niece Arianna Occhipinti crafts her natural styled offerings too, in Vittoria on the southern side of Sicily where Frappato and Nero d’Avola are grown. Stoumen believes in organic/holistic vineyard management and leases and farms most of her vineyards where she can, otherwise she only buys grapes grown by generational farmers that understand their land and respect their total environment, something Martha admires and respects. Her Nero is bright and tangy with a garnet garnet hue in the glass and it shows a burst of wild cherry, plum and red peach on the palate, reminding me of the mentioned Occhipinti and with it’s light wood note it has almost a Jean Foillard Morgon class to it, this is highly entertaining low alcohol wine, at 12.4%, with a fine structure and a mineral tone adding an array of spices and chalky stones to the vivid/vibrant fruit core. This is a medium bodied, but full flavored wine that impresses from start to finish, it has tons of personality and charm, it captures the true Nero d’Avola varietal essences along with it’s California terroir, it is utterly delicious and thought provoking, it’s a wine to spend an evening with and is best enjoyed with rustic cuisine and romantic company. Layers of bitter coco, anise, cedar, earth, florals and tangy raspberry join the party with air, this Martha Stoumen Mendocino Nero d’Avola is seriously good and complexly layered, while staying fresh and playful throughout, drink now.